A toothbrush is used to remove bacteria (plaque) from our mouths, to maintain a healthy dentition. It is important to keep our teeth free from decay and also to keep the supporting tissue (gums) healthy. Our gums should create a tight collar around our teeth to help keep our teeth firm. Teeth can be lost because of gum disease and unfortunately, in my role as a Dental Hygienist, I see many people losing healthy teeth because their gums have let them down. When using a toothbrush, you should brush the point where your tooth comes out of your gum. This is called the gum margin. An electric brush does the movement for you so you do not have to 'scrub' as many people do with a manual brush. Brushing with an electric brush, on the gum margin, for the correct length of time will remove the plaque to keep your teeth clean and fresh and most importantly your gums tight and healthy. it should be efficient and systematic. Don't jump from place to place. Just move your brush carefully along all your teeth. Your gums need to be brushed, but remember they are soft tissue, treat them with respect or you will hurt yourself. Just think that you would not scrub your face with a scrubbing brush! You should be able to brush your gums without them bleeding. Bleeding is normally a sign that your gums are a little inflamed and you may need to have a scale and polish. Scale (tartar) builds up if the soft plaque is not removed well enough and is able to harden on your teeth. If you have any hard build up on your teeth we need to remove it for you very gently in the surgery. The main reason for using toothpaste when we clean our teeth is to put fluoride onto our teeth. Fluoride makes our teeth harder and therefore more resistant to decay. Fluoride has been the biggest boon to dentistry in my lifetime. Other reasons for using a paste is that they foam and they usually taste nice to create a nice fresh feeling after brushing. You need only use a small amount of paste, brush for the required time and then just spit out the excess. Do not rinse after you have brushed and it is best not to swallow. Children should use a very small amount of a child's fluoride paste, which has a lower concentration of fluoride. I hope this brief summary of brushing is useful. If there is anything else you want to know please come and see us. We are always pleased to talk to you at length in the practice. 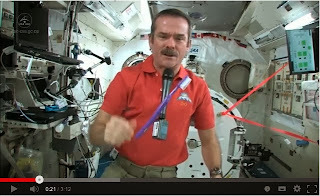 Have you ever wondered how oral hygiene takes place in space? So there you have it. Your basic toothbrush and toothpaste can serve you just as well off the planet as they do on Earth. NOTE: The brushing technique (and swallowing toothpaste) didn’t impress our hygienist, Janet Scott, who said, "I’m amazed that guy has any teeth left!" You can read Janet’s advice on brushing your teeth in our next blog.